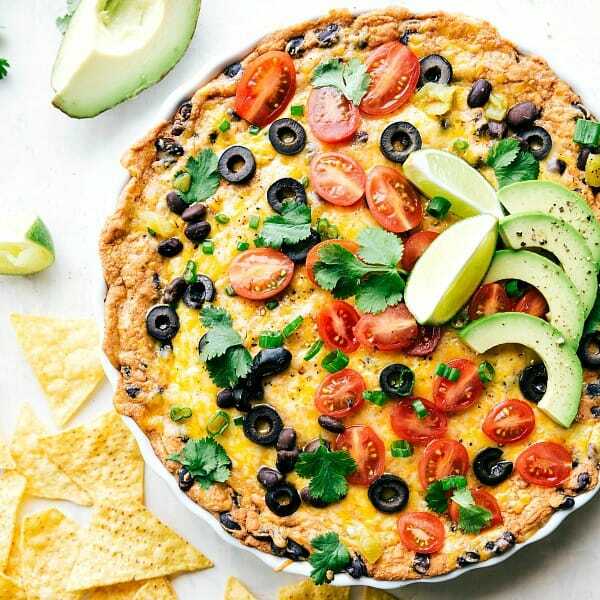 Loaded Texas Trash dip is the classic warm bean dip that gets loaded with corn, olives, black beans, and ooey gooey cheese! This dip will be the hit at your next party! It has been so fun participating in McCormick’s 50 Dips for 50 states project. And today I am representing the good ole state of Texas and having a dip face off again with Sarah over at Dinner at the Zoo. She shared her Wisconsin Brat & Cheese Beer Dip last week against me and her team won! I recently got to visit Texas and they don’t mess around with good food. We had the most amazing BBQ food that I think I will ever have and we completely fell in love with Austin Texas. Heidi over at Foodie Crush just made this dip recipe and I decided to put my own spin on it and load it up! 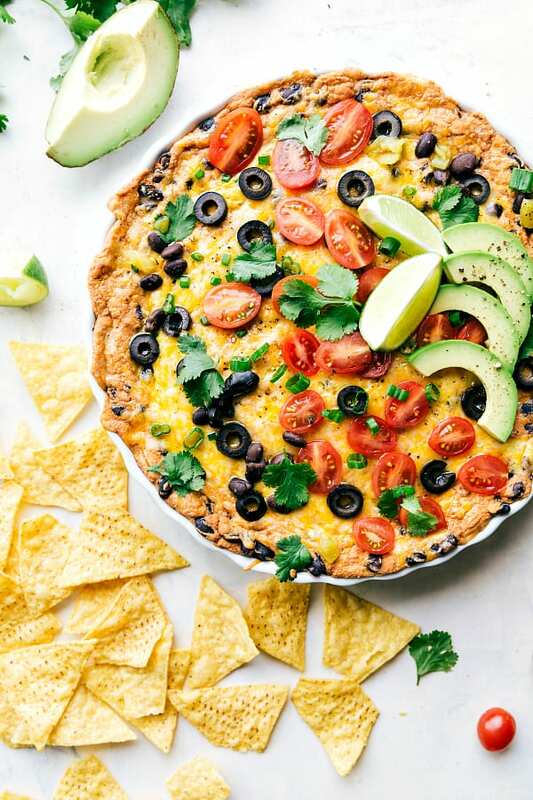 What can be better than a warm bean dip loaded with black beans, corn, olives, green chilis and topped with your favorite toppings? Texas Trash Dip is such a simple dip to make. You mix together some of my favorite things. Cream cheese, sour cream, refried beans. And then you make it even better by adding green chilis, corn, black beans and olives! The taco seasoning gives it the perfect blend of spices and flavor and this dip will BLOW YOU AWAY! This is a MUST make dip at your football game this weekend! And you will see why this dip made me a Texas fan. It is completely addicting and one of the best dips that you will ever make. 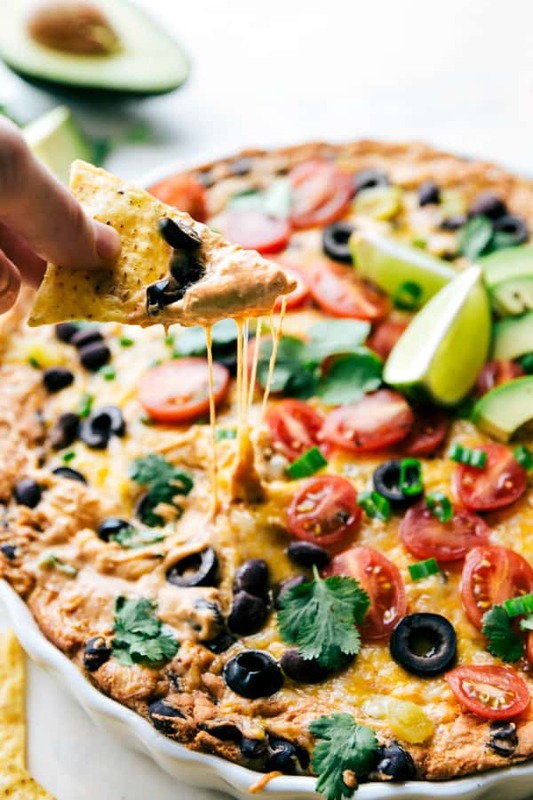 You will not regret making this dip and it will be all of the rage at your next party! This dip is sure to be a winner! Preheat oven to 350°F. Microwave cream cheese and sour cream in large microwaveable bowl on high 1 minute or until cheese is softened. Remove from microwave. Mix with wire whisk until smooth. Add refried beans, black beans, corn, black olives, green chiles, Seasoning Mix and 2 cups of the cheese; mix well. 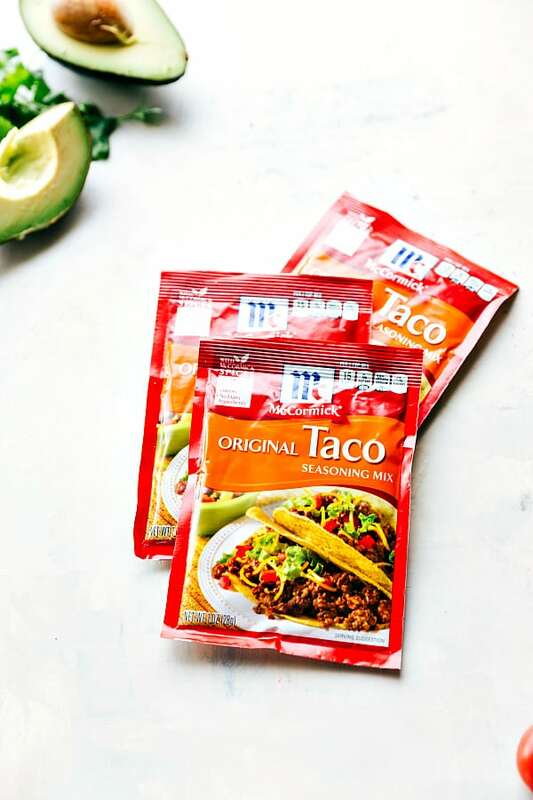 This post was sponsored by McCormick®. I love working with brands that I am passionate about and use in the kitchen for myself. All opinions expressed are my own. I could probably eat this entire dish for every meal! DELICIOUS! Does anyone know if this would be able to be made in a crock pot? I want to take it somewhere so that would be more convenient. Thanks if anyone responds! Slow Cooker Loaded Texas Trash Dip: Microwave cream cheese and sour cream in large microwaveable bowl on high 1 minute or until cheese is softened. Remove from microwave. Mix with wire whisk until smooth. Add refried beans, black beans, corn, black olives, green chiles, Seasoning Mix and 2 cups of the cheese; mix well. Spread bean mixture into slow cooker sprayed with non-stick cooking spray. Sprinkle with remaining 2 cups (500 mL) cheese. Cover. Cook on low 3 to 4 hours or until internal temperature of dip is 165°F (74°C). Note: I have not tried this. The slowcooker instructions originally come from this recipe: http://www.flavour.ca/Club-House/Recipes/Entertaining/Texas-Trash-Dip?utm_source=Facebook&utm_campaign=EverydayContent17&utm_medium=Social&utm_term=Flavour&utm_content=TexasDipENG —But they make sense and I imagine that once you have the dip to the optimum temp, you could add the toppings from this recipe. Good luck! Yes, you will want to drain the corn and black beans! Thanks for letting me know! I will edit that! for our Super Bowl party and it was a huge hit!! Definitely a must have for more parties to come! Do you add the tomatoes and cilantro after it has cooked?